Artists are illusionists. They fool the eye. An artist can create the illusion of depth on a flat surface if they use some very basic rules. These rules really are common sense when you think about it. It is not necessary to use every rule in one composition or drawing, but it will improve your work if you use at least a few of the rules. You may even find that you have been using the rules all along. The rules may have come to you instinctively. 1. Think about the size of the objects as you draw them on the page. Objects you want to appear closer to the viewer should be drawn larger. Objects you want to appear farther away should be drawn smaller. 2. Placement of objects is important. Put objects that you want to appear closer lower on the paper or canvas. Objects you want to appear farther away should be placed higher on the page. 3. As you draw make sure that your drawing has a foreground, middle ground, and a background. This helps give the illusion of distance and space. 4. Overlapping objects will create depth on the page. This can be done by placing one object behind the other one. 5. Use brighter more intense colors and darker values on objects that are closer to the viewer. Artists do this because of atmospheric perspective. 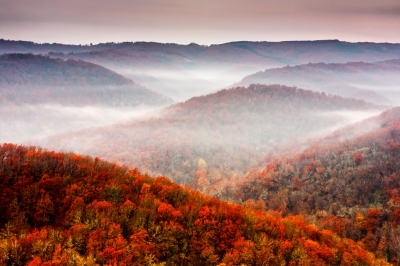 The photograph above titled Autumn Fog is a perfect example of atmospheric perspective. Dictionary.com defines atmospheric perspective as the perception of depth in nature as enhanced by haze in the atmosphere; how the appearance of objects is altered over distance by the effects of the air between the viewer and the object. It is also called aerial perspective. 6. Add more detail to objects that are closest to the viewer. For example: Think about how much detail you can see in your hand if you hold it close to your face. Now, think about the detail you see in a person’s hand that is across the room from you. Obviously you can see more detail in something that is closer. Play that up when drawing or painting. Now that you know these basic rules for creating depth on a flat surface, try to do a drawing using some of them. Let me know how it goes. Have fun! !